At Richardson Eye Associates we provide comprehensive eyecare to meet the needs of all of our patients, including the latest vision-correcting surgeries ... LASIK and PRK. We have established close working relationships with the best LASIK and PRK surgeons in the Dallas area; surgeons who have earned our confidence and trust over years of co-managing patients together. We provide the pre- and post-operative care for our patients in our office, while the actual operative procedure is done by a skilled surgeon at a nearby laser center. This will ensure you attain the best result and clearest vision possible using advanced state-of-the-art equipment and techniques. Both LASIK (Laser Assisted in Situ Keratomileusis) and PRK (Photorefractive Keratectomy) are surgical procedures that use a laser to reshape the front lens of the eye called the cornea, changing the way it focuses light. These procedures are intended to correct a patient's vision so that the need for glasses or contact lenses is minimized or eliminated. The two procedures are very similar, but differ in that the LASIK procedure lifts a portion of the front of the cornea to create a "flap" before using the laser to reshape the tissue underneath. After the laser has completed the reshaping, the flap is returned to its original position and allowed to heal. In PRK, there is no flap created. The laser reshapes the tissue and then a special contact lens called a "bandage lens" is used to cover the area treated by the laser while the tissue heals underneath. Which should you choose? It's not a matter of choice, really. The doctor and the surgeon will advise you on that decision. 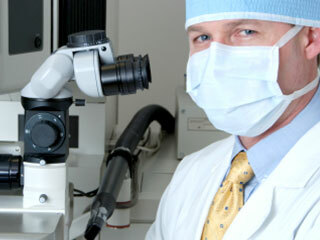 Laser surgery is effective in treating myopia (nearsightedness), hyperopia (farsightedness) and astigmatism. In order to determine if you are a candidate for one of these procedures, a comprehensive eye examination is a required place to start. Your eyes must be healthy, your prescription must be stable, you must have no contraindicating medical history, you must have an accurate knowledge of the procedures and reasonable expectations of the outcome. We pride ourselves on being extremely thorough in our evaluation, and taking the extra time to educate our patients about the positives and negatives of both procedures as pertaining to their particular case. LASIK and PRK, in spite of their popularity and widespread advertising, should be taken seriously and are not for everyone. You can trust that we have your best interest and longterm wellbeing foremost in our minds as we work with you. It's impossible to address everyone's questions about LASIK and PRK in a short narrative like this. If you are seriously considering one of these procedures and would like to discuss them in more detail, please call our office at 972-231-3439 to schedule a consultation visit with the doctor. We will set aside up to 30 minutes of the doctor's time to meet with you at NO CHARGE and no obligation to move forward. We want to help you with this most important decision.